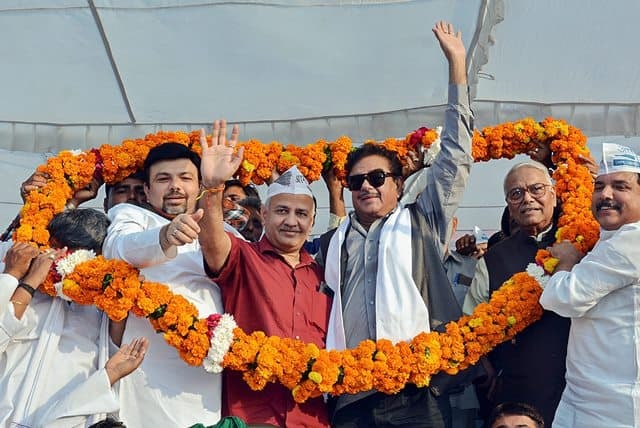 In what was seen as coming for several weeks now, Shatrughan Sinha formally joined Congress party in Patna on Saturday. He is likely to contest from Patna Sahib Lok Sabha seat on the party ticket. Sinha, who was denied a Lok Sabha ticket by the BJP for his alleged “anti-party” stance, while joining the party revealed, RJD chief Lalu Prasad Yadav advised him to join the Congress. “Lalu Prasad has a big role to play in my joining the Congress, he send me here on the day of Navratri. Though I am little upset on leaving the party (BJP) on its foundation day,” said Sinha. He also said that old-guards are undermined and sidelined in the BJP. In an apparent reference to Prime Minister Narendra Modi and BJP president Amit Shah, Sinha alleged that BJP is “one-man show and two men Army”. “The BJP is one man show and two men Army. Condition is such, that ministers there are afraid of appointing their personal secretaries without asking PMO, “said Sinha. “Yashwant Sinha left BJP as he was compelled to, such circumstances were also created in front of Jaswant Singh, Arun Shorie and others. We all know about what happened with Murli Manohar Joshi and Lal Krishna Advani. My fault is that I always spoke the truth and stood with Advani,” he added. When asked about his wife Poonam contesting against Union Home Minister Rajnath Singh from Lucknow he said: “everything is possible”. Sinha was elected twice, in 2009 and 2014, from Patna Sahib Lok Sabha seat. Bihar will vote in seven phases from April 11 to May 19. Counting of votes will take place on May 23.